air support for transport helli. Hello I am working on an escape style mission i was wondering if there is a way to have another air unit defend the transport helli? We use multiple helos in a PJ configuration. All you do is command them separately, actually not too hard, and I have yet to see them crash when used correctly. 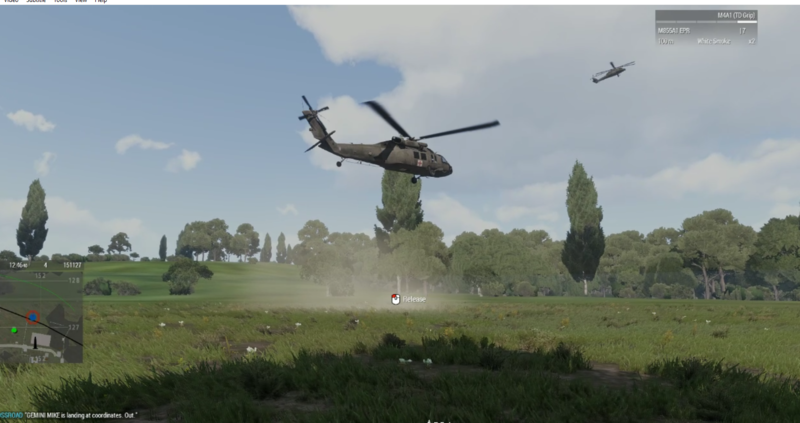 For what we do, a Blackhawk takes off, and circles an LZ with guns hot. Once I tell him this order, I wait 5-10 seconds to make sure there will be a gap. I then command my MEV bird to land or pickup at the desired LZ. This creates a orbiting guard helo, while we are able to load wounded in the MEV bird. Hope this makes sense.